Isaiah 58 (like much of Isaiah) is awesome. For example, here’s verse 2. At least (I’d say) if we think it needs interpretation, that may be because we are unwilling to let it just say what it says. I suspect it means what it says, which is, at any rate, that the “nation” in his day looked pretty “spiritual”; still it sounds like he’s setting them up for some blunt criticism. The implications merit drawing out – it is possible to appear to be what we are not, even in such weighty matters as seeking God, or being a nation that “does what is right.” And Isaiah is willing to be somewhat insulting to his hearers by wording it not as a direct accusation, but an assumption, saying “as if they were a nation that does what is right,” rather than “you pretend but are not”. Then he give us one of those fairly common prophetic rejections of contemporary culture-religion. In this case, their formal days of self-humbling, or of fasting before the LORD, are not cutting it. Sounds like they’re pretty committed to their faith. But when Isaiah gets explicit about their offenses, he tosses their religious observences aside as less than worthless, and focuses instead on economic issues. Imagine that. You know, if you collect all the Bible passages that focus on homosexuality they would take up less space than this one chapter. And this is only one chapter out of the many that focus on economic and political-power (justice) issues. Why, then, does the American Christian-Republican (dominionist) movement (and power-bloc) talk so very little about injustice in economic and political-power matters? I’m serious. What’s the answer? Why do they not talk about it? Anyway, Isaiah does get specific. The trouble with this kind of specificity is that it’s somewhat less than specific. 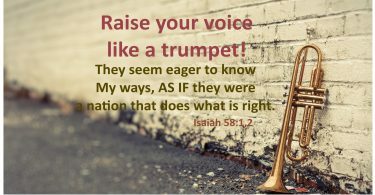 It requires a careful awareness of one’s own society, and of one’s own actions AND their extended consequences, in order to discern the next possible steps to take in response to Isaiah’s criticism. It seems clear to me that he expects his hearers to already know just what he’s talking about, since they apparently have positions of relative power and influence in their society. That is, they are in position to know the details he’s complaining about, and Isaiah seems to assume that they DO know. “Well, maybe he has interesting, or at least emotionally appealing points there. But we do have good reasons for what we do. After all, these patterns have taken generations to develop. But hmm, what about xxxx. He no doubt wants to complain about that. Well, THAT’s not going to change. That’s part of our way of life. It’s not really as terrible as he makes out. No, Isaiah. Just shut up. You are way out of line. But what always hits me hardest in this chapter is the enormity of the promised blessings. Wow. Do we ever need healings – of many kinds – in this country! This sounds like a moral “trickle-up” strategy for renewed national health. If we as a nation will attend to the issues God is “fussing about” we will find amazing and wonderful things following in consequence. Unfortunately what God is fussing about and what religious leaders are fussing about are often unrelated theings. But blessings like those in these next verses are clearly desirable whatever the precise meaning of the symbols is. Here are four potent r-words of blessing. It’s strange to realize, but the people who listened to Isaiah could see archeological ruins in their country that went back hundreds of years, some that were even as old to them as ruins from Isaiah’s day are to us. They were signs of ancient prosperity and freedom – prosperities and freedoms long since lost and forgotten. Isaiah is offering a way to recover lost prosperities and freedoms. That is a very big thing. And the core of his requirement – so that we might hope for such renewals – is in matters of economics and of political power. Then there is a short reference to religious law, regarding keeping a weekly holy day. We know that, by the way he behaved on the Sabbath in the synagogues and outside them, Jesus repeatedly offended the religious establishment. And remember, as a Rabbi and a frequent leader in synagogue service, he was a part of that same religious establishment. He also had high regard for the book of Isaiah, from which he quoted fairly often. In the light of the way Jesus (and later Paul) talked about holy days and special religious observances – and in light of how Isaiah himself talked about such things earlier in this chapter and elsewhere throughout the book – I think we have to regard this injunction about Sabbath-honoring in a way that is not just about formal religious law-keeping. Your whole life is a gift from God, and finds meaning in your enjoying that fact, and in continuously giving it all back to God. Do not just drift; do not just waste time, energy, money, etc. doing whatever comes along or whatever “everyone else” is doing. Attend with respect and love to the presence and gifts of God in and around your life on a daily basis. Let there be meaning – recognize and enjoy the meaning – in all you say and do. Then you will find yourself becoming a participant in the awesome blessings promised in this context.